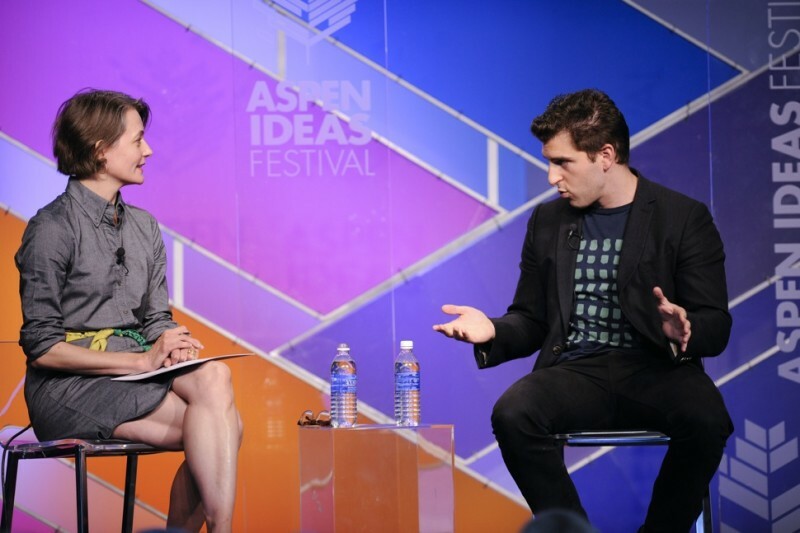 Brian Chesky, CEO and co-founder of Airbnb, right, speaks with Jennifer Bradley of the Brookings Institution, on Sunday, June 29. 2014 at the Aspen Ideas Festival. ASPEN – Airbnb co-founder and CEO Brian Chesky found a place to stay in Aspen Saturday night for about $100 by going on to the Airbnb website, which connects people who need a place to stay with people who have space to rent. Chesky said Eric was an experienced Airbnb host, and is one of about 450 people in Aspen now renting out all or part of their homes here through Airbnb. “I think we’re an important part of his life now,” said Chesky of Eric. What Chesky did — contacting a host through Airbnb, letting the host vet him as a potential guest, and then showing up — is increasingly common around the world. 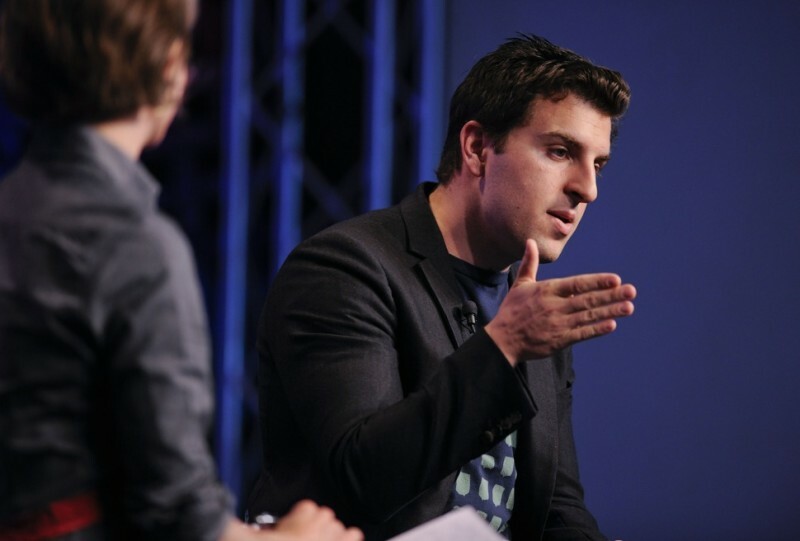 Tonight, 300,000 people in 192 countries will be renting a place to sleep through Airbnb, Chesky said Sunday. And of the 600,000 people going to Brazil for the World Cup soccer tournament, 120,000 are finding places to stay through Airbnb, he noted. That helps explain why Airbnb, still a private company, raised around $450 million in private equity this year with help from TPG Capital, whose co-founder, David Bonderman, owns a home in Aspen. Airbnb is now valued at $10 billion, more than the largest traditional hotel chains. And Chesky, 32, is said by Forbes to be worth $1.5 billion. He started Airbnb with Joe Gebbia and Nathan Blecharczykin in 2008 after renting space in their San Francisco apartment for people to sleep on air mattresses. Brian Chesky, CEO of Airbnb, right, speaking with Jennifer Bradley of the Brookings Institution. It’s wasn’t clear Sunday afternoon if “Eric” of Aspen had paid sales taxes to the city of Aspen on the rental of a bedroom in his home to the CEO of Airbnb, but city officials would likely encourage him to do so. The city estimated in March 2012 that it was losing $100,000 a year in sales taxes and licensing fees from people using the Internet in some fashion to rent their homes and condos short-term. The city council voted to let people rent their domiciles as often as they wanted, as long as they got a license, paid taxes and named a local representative to respond to complaints about things like parking, trash and rowdy guests. And the city hired a company called VR Compliance to scour the internet looking for properties being rented without a license. Once it knows who is renting their unit on their own, city officials reach out to the property owner and encourage compliance. As of February 2014, the city had a total of 61 short-term rental licenses on file for people booking their units over the internet. In 2013, the city brought in $73,000 in revenue from 30 new licenses brought into compliance over the previous year. For owners in Aspen, a city license means sales taxes of 11.3 percent, on top of the 3 percent in fees charged by Airbnb. A renter on Airbnb pays what the host asks plus 6 to 12 percent to Airbnb. Aspen is not the only city working to tax this new approach to lodging. Portland, Ore., reached a deal this spring with Airbnb and the company will now collect lodging taxes on its rentals and remit them to the city instead of relying on individual hosts in the city to do so. “We want to be regulated, because to regulate us would be to recognize us,” Chesky said Sunday during a pointed interview with Jennifer Bradley of the Brookings Institution. Chesky responded by noting that the “neighbor issue” was not a problem for Eric’s neighbors in Aspen. Chesky said the company also regularly removes bad actors — either unpleasant guests or hosts that violate company policies — from its platform. “We are not shy about removing people” from the Airbnb system, Chesky said. Editor’s note: Aspen Journalism is collaborating with the Aspen Daily News on coverage of the Aspen Ideas Festival. The Daily News published this story on Monday, June 30, 2014.